The BorderTransportationSystem will contain standard High-Speed Rail track and Mag Lev track. The Mag Lev track will connect with the Mexican Mag Lev track that is coming across the border in Texas and is scheduled to proceed up I-35 into Oklahoma. 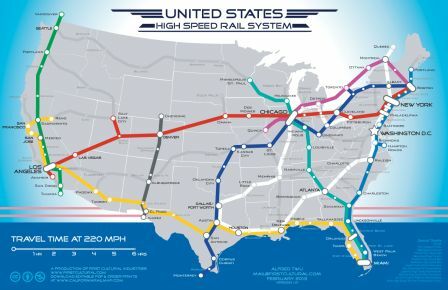 The High-Speed track can be connected to the Tucson - Phoenix line, the California line, and the Dallas - Fort Worth lines. Eventually both systems can be expanded to include all sections of the U.S.A., Mexico, Central America, Canada, and South America. By following existing interstate highways and existing railroad tracks the cost of the systems can be minimal as little land will have to be purchased. This will not happen overnight as it will take full cooperation of most of our state governments, and it will need to be funded by investors that feel he or she can benefit from the systems. But, it needs to be, for in 40 to 60 years we will be out of fossil fuels, most vehicles will be electric, freight trucking will be overloaded, and air travel will be super expensive if even available. Our fuels will be needed by our Military, and thus rationed as this will become a national security problem. The BorderTransportationSystem proposal will move the Yellow route south to the border and thus, provide not only security but opportunities for both nations. It also provides nearly 10-days of freight transport savings over the current use of standard rail, trucking, and shipping via the Panama Canal. Note that the BorderTransportationSystem design can become the 'template' for adding the other transportation systems in each country, i.e. High-Speed rail combined with Mag Lev and power generation, plus transport of fuels and water supplies.